Never a stranger to streets full of riot police and thousands of demonstrators, former Prime Minister Tony Blair finally touched down in Copenhagen hoping to weigh in on the Globalists’ latest existential threat to civilisation as we know it- human induced ‘Climate Change’. Opponents of the IPCC’s struggling science couldn’t have asked for a better weather backdrop forecast for the second week of COP15 and the hounourable Tony Blair’s arrival… snow. Fresh off back to back UN scandals, and a public inquiry of Blair’s role in taking the UK into an illegal war, critics are expecting the Globalist damage limitation spin machine to shift up into high gear. Piers Corbyn, astrophysicist of Weather Action (UK) solar-based long-range forecasters, said: “We are very pleased with these blizzards forecasted by our Solar Weather Technique which depends on solar-particle and magnetic effects and has nothing to do with CO2. “Our forecast created about 30 days ahead and announced about 20 days ahead was very specific that 14-16/17 would be particularly snowy with biting cold winds in the region. What we said 30 days ahead was as good as standard Met 2 days ahead. The blizzards might concentrate some minds into the realisation that the whole of the CO2 Climate Change junket is a world scam based on failed science and fraudulent data”. Read Weather Action’s latest report and ‘EU CLIMATE PLEDGE’ from Copenhagen(PDF). With meaningful negotiations between the world’s Developing Nations and the West all but broken down in the wake of the Danish Text Leak scandal, it appears that the Globalist governing class have called out to the bull pen for their experienced relief pitcher and master of the political knuckle ball- former British Prime Minister Tony Blair. The UK’s Weather Action astutely points out that the former PM is suggesting that world leaders should take action as a “precaution”. The same exact Orwellian spin was of course used to justify the Iraq War, faithfully executed even though based on the lie of non-existent Weapons of Mass Destruction. Tony Blair, master of spin and esteemed NLP practicioner. Yet, as the British public finally see the spin from the Iraq wear off under the modest light of public inquiry, another arguably larger social engineering campaign still persists. Knowing what we now know from Climate Gate and from newly formed science groups like the ICSC and their 140 leading climate experts from 17 countries who seek to challenge to IPCC’s sacred consensus, should far-reaching climate policy be based on a lie? Recent comments about climate change from Blair may serve as a reliable gauge as to the extent of the political divisiveness and desperate whitewashing we have witnessed post Climategate and during this UN Climate Change Summit in Copenhagen. 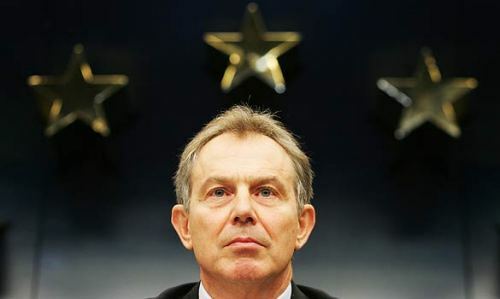 If you ever needed a better insight into the dark arts of political spin and public deception which are routinely employed on the masses in order to justify any number of bankrupt policies, you only need to watch and learn from the progenitor of modern Spin 2.0, Tony Blair. Perhaps the most basic and telling statement of them all appears in the Guardian article, where Blair spells out the political modus operandi behind Climate Change alarmism as Blair confesses, “I mean obviously you would have had to use and deploy different arguments about the nature of the threat.” Very insightful. Hindsight can be a wonderful tool for wisdom and understanding. Judging by historical record, it seems that Climate Change and the Iraq War have much in common after all. Now it’s up to concerned citizens to act now and contact their representatives in order avert this latest imperial power grab by the UN’s and the World Bank’s new fledgling department of global government.